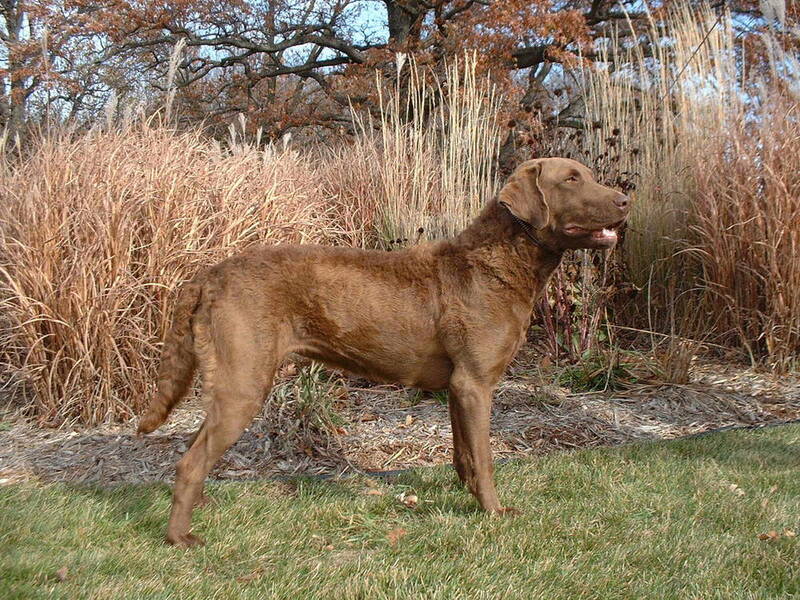 The Chesapeake Bay Retriever is a hardy and resilient breed designed to retrieve waterfowl from cold waters, sometimes even breaking ice to do so, and the features of the dog reflect this purpose. 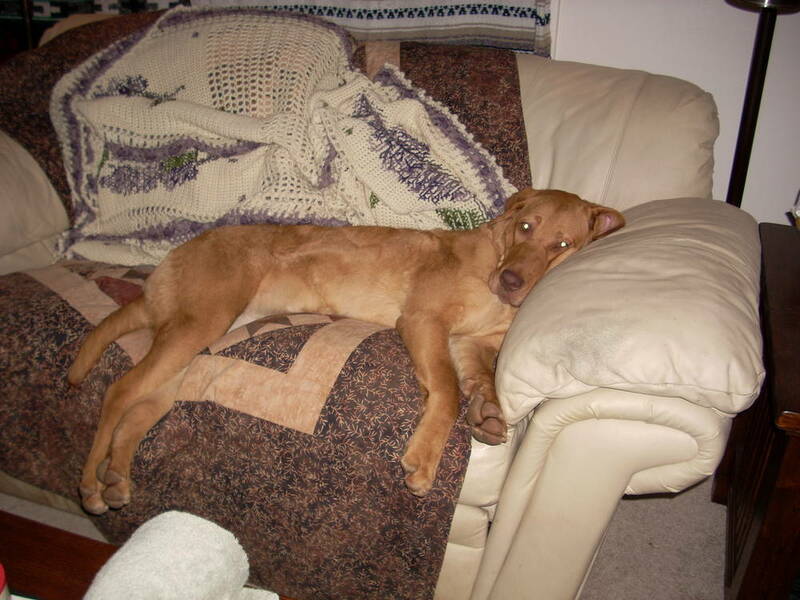 The skull is round and broad with a medium stop, the scissor-bite jaws large enough to carry large birds with ease. 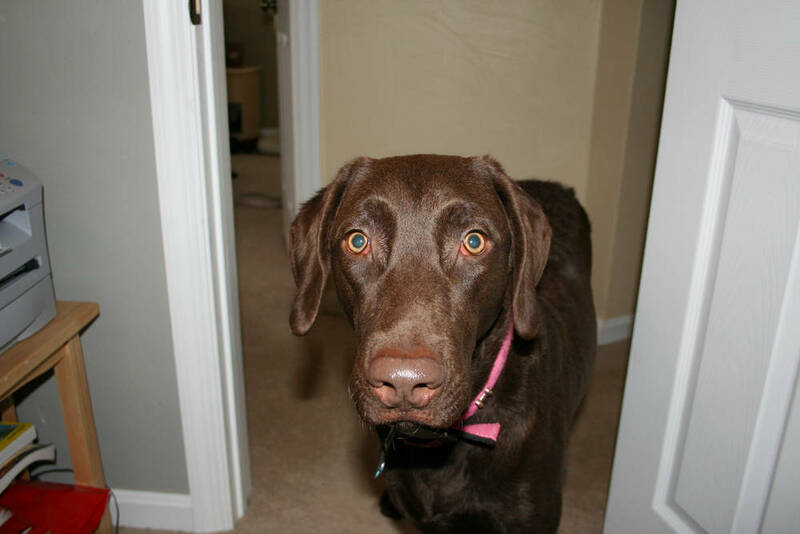 The eyes are large and clear, amber in color, and convey an expression of intelligence. The neck, shoulders, back and chest are powerful and well muscled. 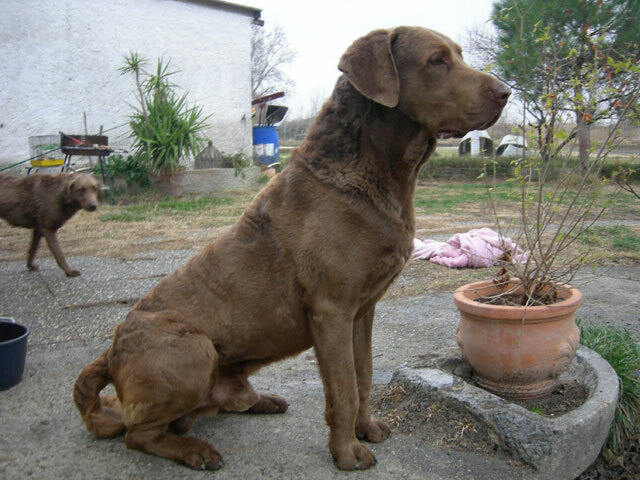 The hindquarters are slightly higher than the forequarters and are exceptionally strong, making this dog a remarkable swimmer; webbed feet also help to propel this dog through the water. 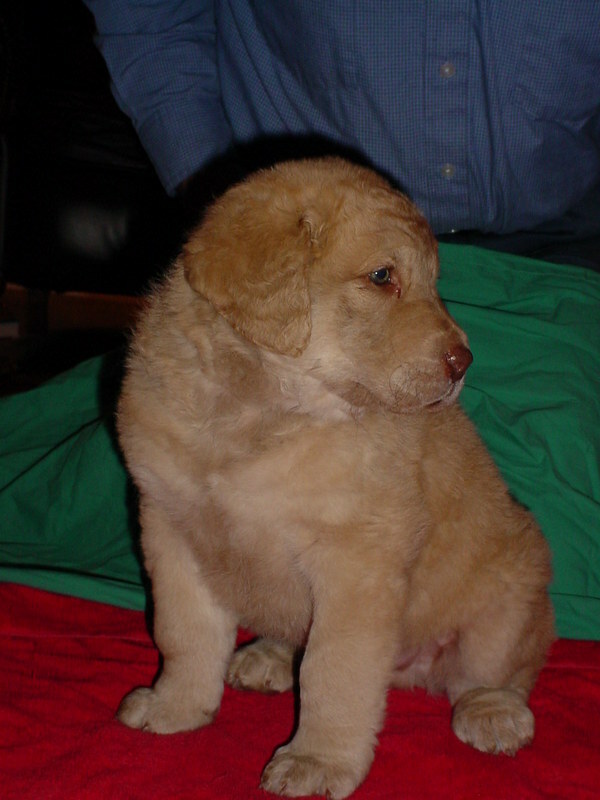 The tail is either straight or slightly curved, with moderate feathering. 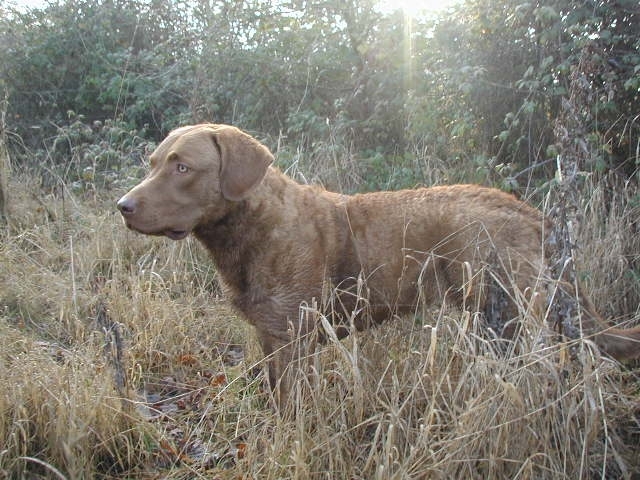 The coat is thick, short and oily the oiliness of the coat is especially important in this breed, as it is essential to keeping the dog warm and dry when working in and around cold waters. 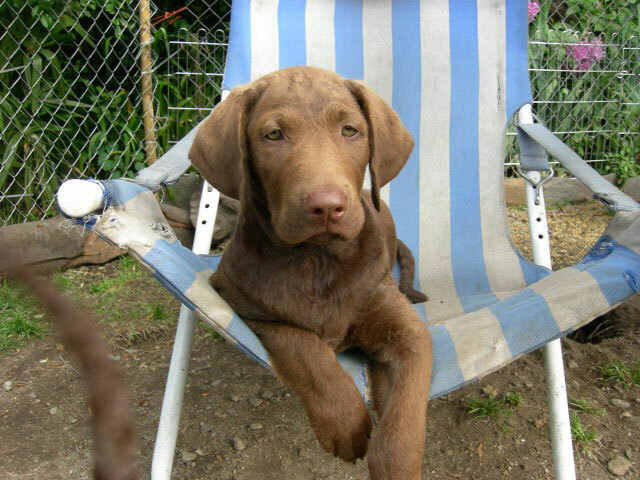 The coat should be brown in color, and a Chessie that matches her surroundings in the field is to be especially prized. 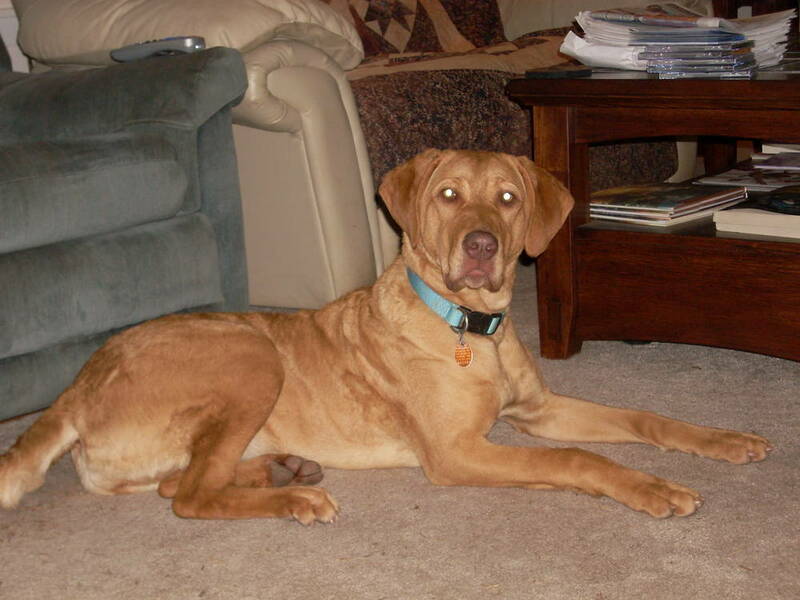 Height (Male) 23 - 26"
Unlike the always-sociable Labrador Retriever, the Chesapeake is generally aloof around strangers and is protective of its home and family. 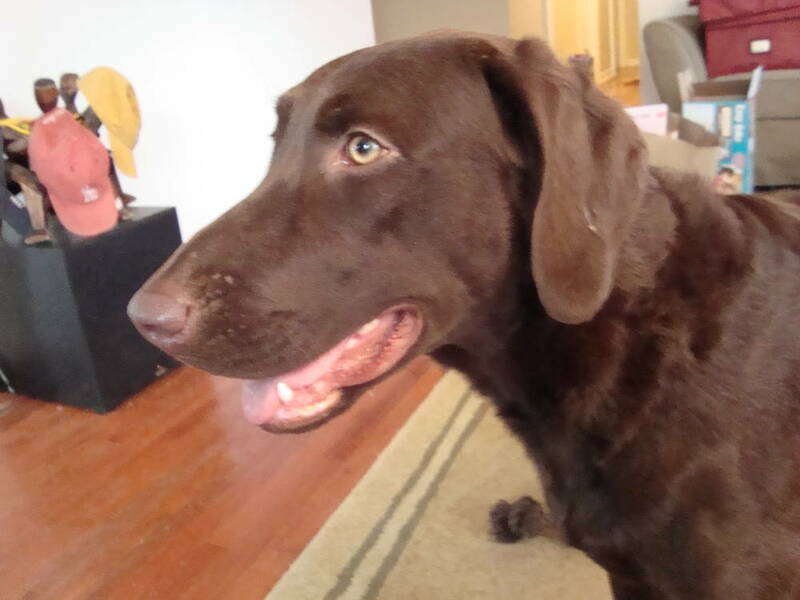 Despite its somewhat distant character around strangers and other dogs, the Chessie is exceptionally affectionate toward its master and family. 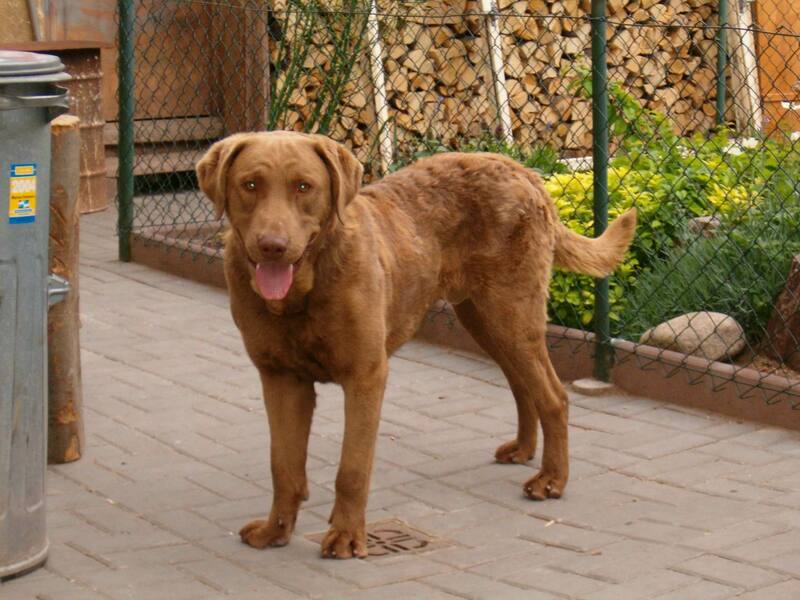 For an owner looking for the playful qualities inherent in the retrieving breeds as well as a family protector, the Chesapeake Bay Retriever is a fantastic choice. 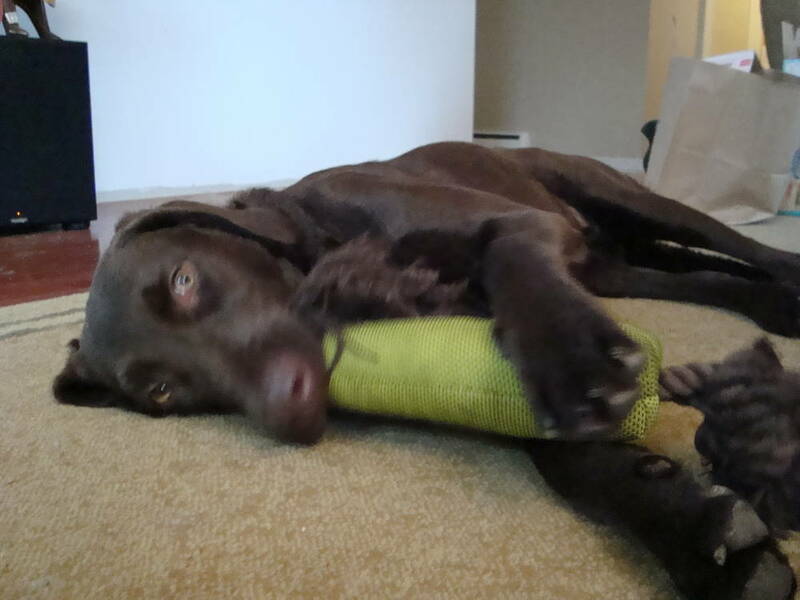 While the dog is happiest when it is able to swim and retrieve outdoors, it is also content to be at home with its family and tends to be calm and quiet indoors. 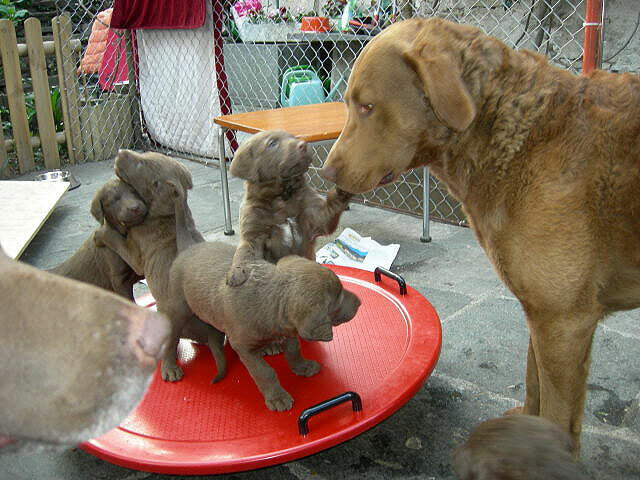 The breed can live outdoors but prefers to live inside with the family. 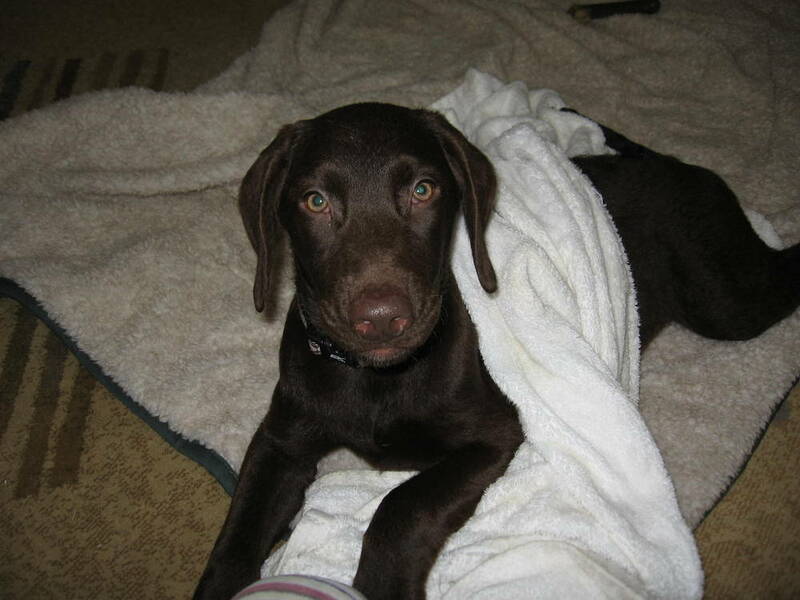 The Chessies oily and wavy coat is easily maintained with weekly brushing and rarely requires washing; in fact, the water resistance of the coat can actually be damaged by over-washing. 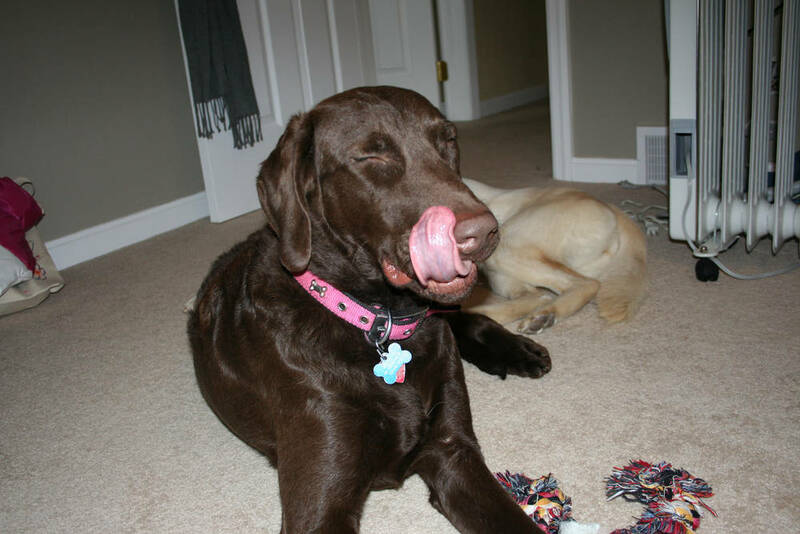 Significant health concerns for the breed include canine hip dysplasia and gastric torsion; less common problems include progressive retinal atrophy and hypothyroidism. 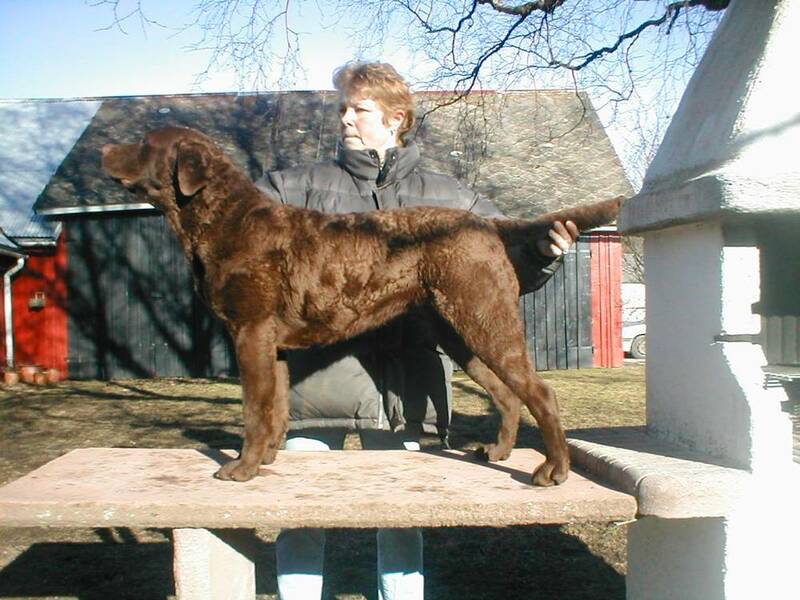 In 1807, two pups (assumed to be Newfoundlands, one red in color and the other black) were rescued from an English brig shipwrecked off the coast of Maryland. 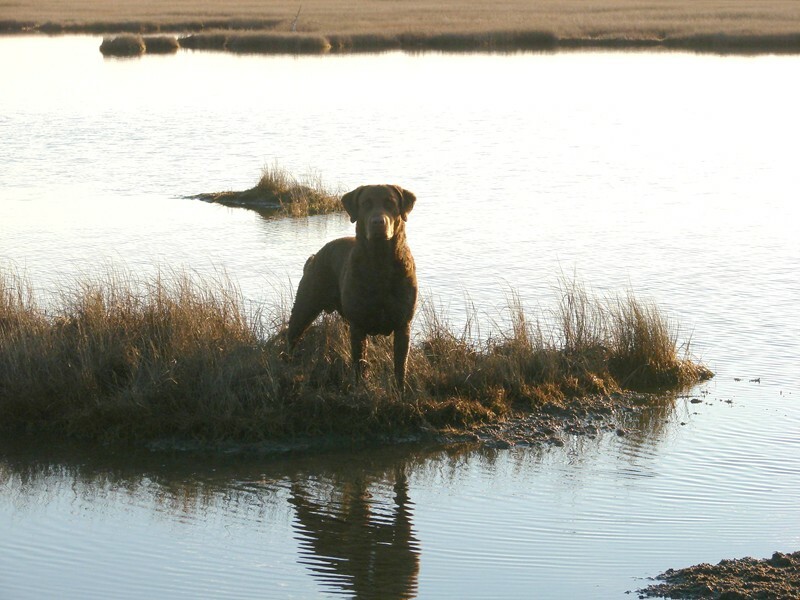 As the pups grew they gained the reputation of skilled water retrievers, particularly suited to the cold and unforgiving waters of Chesapeake Bay. 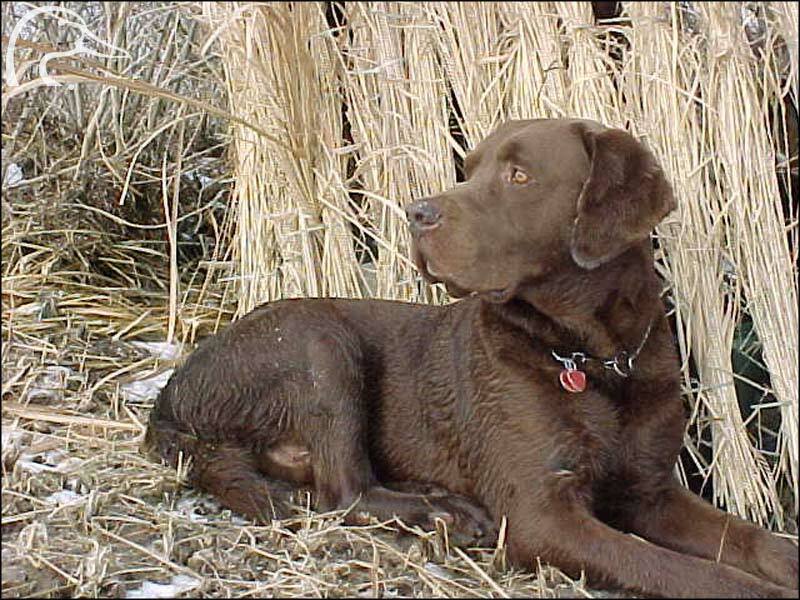 Over time, the progeny of these dogs were bred with Bloodhounds, Newfoundlands and local hound crosses to create the breed we recognize today.The Chesapeake Bay Retrievers willingness to repeatedly swim through icy waters without hesitation to retrieve ducks and other waterfowl, as well as its ability to mark and remember where a hunters quarry has fallen, helped to spread the breeds renown throughout the United States. 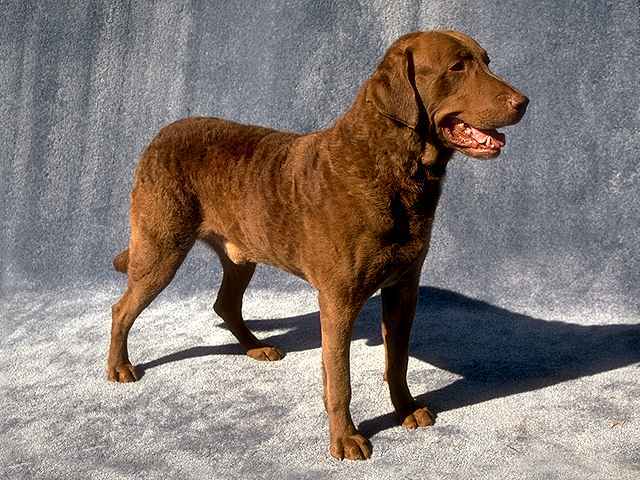 In 1885, the Chesapeake Bay Retriever was recognized by the American Kennel Club, making it one of the oldest AKC-recognized breeds and one of the few breeds created in the United States.